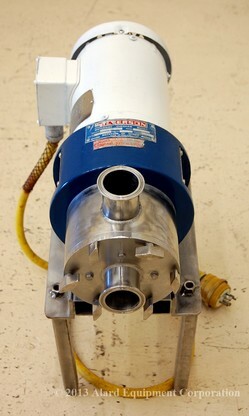 SILVERSON model 275LS HIGH SHEAR IN-LINE MIXER / SHEAR PUMP, T316 stainless steel with 2 inch Triclamp inlet and outlet on a stainless steel frame with a 2HP 3450 RPM 208/230/460 volt 3 phase motor. Manufacturer rated for 5 to 50,000 gallons per hour capacity and 100psi maximum working pressure in emulsifier, homogenizer, disintegrator, colloid mill applications. This pump is fitted with a head with 3/8 inch diameter perforations surrounding the high-shear impeller. A range of different heads is available from the manufacturer for different application needs. 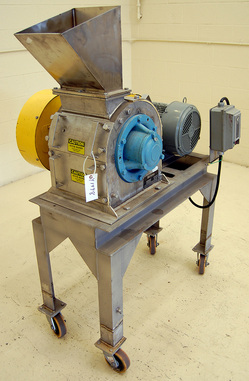 As of this writing, this shear pump emulsifier is in stock at Alard, in EXCELLENT operational, mechanical, electrical and cosmetic condition, available for immediate shipment. 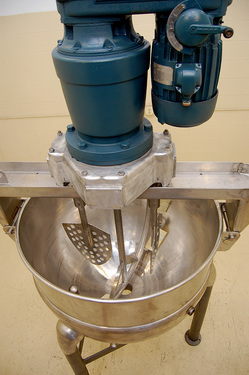 STAINLESS STEEL DOUBLE-MOTION TILT BLENDER / MIXER, 250 lb (120 kg) capacity. 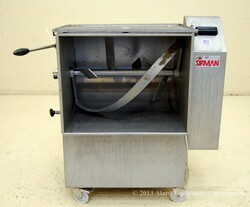 Sirmann model IP-B KG120 with 25 inch long by 19.75 inch wide by 23 inch deep U-shaped stainless steel vessel with horizontal shaft with (4) paddles, with counter-rotating sweep ribbon, tilt to dump discharge. 43 inch infeed height, 19 inch discharge height on a stainless steel support frame, on casters. Complete with slotted top cover with safety switch wired to an onboard operator control panel with interlock safety shutoff; 220 volt single phase electrical input. 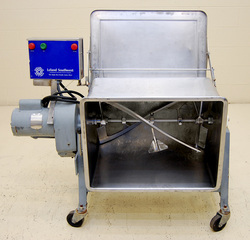 As of this writing, this portable tilt-to dump paddle mixer / meat mixer is in stock needing cosmetic cleanup, but otherwise in excellent operational, mechanical and electrical condition, available for timely shipment. 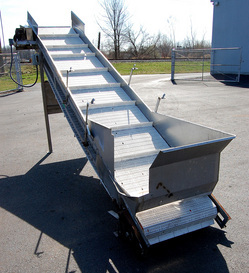 STAINLESS STEEL ELEVATING BELT CONVEYOR with HOPPER infeed; 30 inch wide by 14'6" long. A 30 inch long by 48 inch wide by 24 inch deep tapered infeed hopper feeds to a white food grade plastic interlocking-chain type conveyor belt, with 2 inch high cleats on 18" centers, running between 5" high stainless steel sides. 36 inch infeed height, 80 inch discharge height. Complete with a 3 phase gear motor drive. immediate shipment as-is; OR with lead time, can be serviced prior to shipment by our shop, so as to assure very good operational condition. 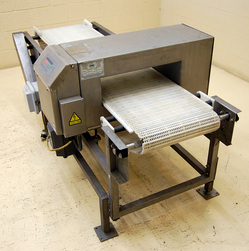 URSCHEL QUANTICUT DICER / STRIP CUTTER / SLICER / CRINKLE CUTTER. A versatile three dimensional cutter manufacturer rated for large product infeed and high capacity output for products up to 10 inches in any dimension, for slice knife thickness of 1/16 inch to 1 1/8 inch (1.6 to 28.6mm) for flat slices, 1/8 inch to 1 inch (3.2mm to 24.5mm) for crinkle slices, circular knife cuts of 5/32 inch to 3 inches (4mm to 76.2mm), and crosscut knife cuts of 1/8 inch to 2 5/8 inch (3.2mm to 66.7mm), for a wide variety of food products, including potatoes, carrots, turnips, rutabagas, celery, pineapple, peppers, and a plethora of other products. for 3/8 inch cuts; the slice thickness is knob adjustable. Complete with a factory operator control panel with variable speed controls, and an interlock safety system, controling a 7.5 HP 3 phase drive. 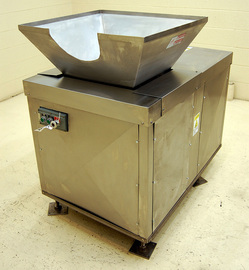 As of this writing, this QuantiCut dicer is in stock in good condition, available for immediate shipment AS-IS (needing general cleanup, missing discharge chute door, and upper discharge chute); -- OR can be meticulously serviced to excellent mechanical and cosmetic condition, including completion with all chutes and doors, prior to shipment by our shop. 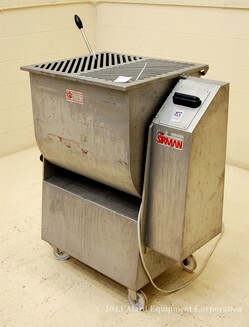 RECONDITIONED SPIN DRYER, Bock Model FP-90. Manufacturer rated 130 lb capacity, 7.36 cubic foot removable basket which measures 30" diameter x 18" deep. All stainless steel product contacts. Includes operator controls with 10 minute settable timer, safety interlock lid, 5HP 230/460 volt 3 phase motor, and pneumatic brake. As of this writing, this REFURBISHED BOCK FP90 spinner is in stock in EXCELLENT operational, electrical, mechanical and cosmetic condition, ready to go and available for immediate shipment. NOTE: Picture shows two white existing "curtains", one over each of the screen sections, which were presumably used to slow product passage. We would normally remove these, but can leave them on the machine if you want them. ...36 inch wide by 67 inch long screen bed, with (2) 31 inch long by 36 inch wide screen sections separated by a 2 inch step, with a solid-bottom discharge section tapering to a 12 inch wide discharge opening. Both screen sections currently fitted with wedge-wire dewatering screens with 1/8 inch openings; --first screen rods run perpendicular to flow, second screen rods run in-line. The screens are held in place by quick-release hooks for fast changeover (only one set of screens is included), and the screen bed runs between stainless steel sides, 14 inch high at the infeed, and 7 inch high at the discharge. Beneath the screens is a 36 inch long stainless steel dimpled / rigidized (stick resistant) surface full-width dewatering catch tank, tapering to a 3 inch Triclamp outlet. Key Iso-Flo model 424148-1, can be either ceiling hung or floor standing; currently configured with 17 inch tall tubular stainless steel legs, for approximately 48 inch infeed height, and 30 inch discharge height. The shaker sits on standard Key Iso-flo fiber-slat arms, and is powered by a new-style Key vibratory-eccentric drive, with 1HP 3 phase motor. 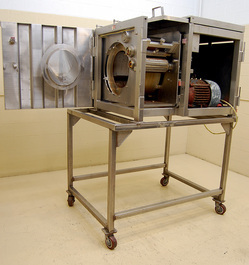 As of this writing, this Key Iso-Flo dewatering screen is in stock in VERY good condition, available for immediate shipment set for 575 volt 3 phase, or with lead time, motor voltage can be changed to buyer specification. ...with 9 inch wide feed belt. A two-dimensional cutter, manufacturer rated for firm products up to 1/2 inch thick, with included feed roll, or thicker if product is compressible. Urschel rates the J9A cutter for producing a variety of dices and strip cuts. Circular knives can be configured for cuts from 3/16 inch to 2 inches (4.8mm to 50.8mm), and crosscut spindles are available for cuts from 1/16 inch to 3 inches; --cutting a diverse array of products such as meats (beef jerky, bacon strips, sausage crumbles), baked goods (pita chips, bread dices for croutons, brownies), and vegetable products (greens, peppers, etc). 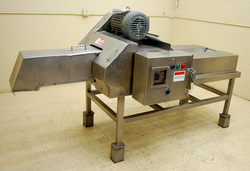 Food grade / USDA sanitary stainless steel construction; including frame, guards, shrouds and cutting spindles. but we can set the machine up for other dice sizes (please tell us your cutting specification!). Complete with a factory electrical control panel with operator controls and safety interlock system, controlling a 5 HP 208/230/460 volt 3 phase drive motor. As of this writing, this Urschel strip cutter / dicing machine is in stock in good condition, available for timely shipment. 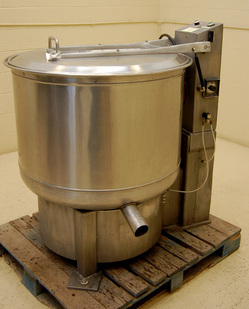 HAMILTON Model SA150, 150 GALLON STAINLESS STEEL STEAM JACKETED KETTLE with TRIPLE MOTION SCRAPER-AGITATOR. 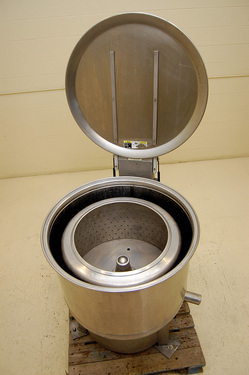 44" diameter by 33" deep hemispherical bottom stainless steel vessel with a 4" diameter center bottom outlet with Tri-clamp connection. The mixer vessel is stainless steel steam jacketed, manufacturer tagged, National Board coded, and U-stamped for 125 psi steam pressure. 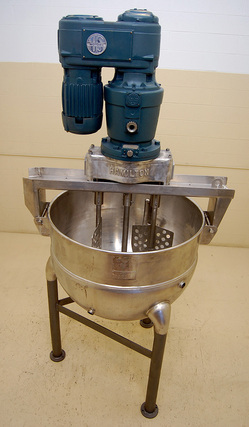 The kettle is topped with a stainless steel mixer bridge, with a scraper agitator flanked by (2) offset paddle agitators, powered by a 3 HP 3 phase variable speed drive. 64" infeed height, 27" discharge height, on steel support legs. The steam jacket has been hydrostatically pressure tested and holds pressure with no leaks, and the agitator has been reconditioned. As of this writing, this triple motion kettle is in stock in excellent operational, mechanical, and cosmetic condition, available for immediate shipment. METAL DETECTOR - SAFELINE DIGITAL STAINLESS STEEL CONVEYORIZED WASH-DOWN METAL DETECTION SYSTEM with PUSH-OFF REJECT, 14.75 inch high by 13.75 inch wide usable aperture opening. The all stainless steel washdown sealed search head is mounted on a stainless steel tubular frame BELT CONVEYOR. Previously used on a single belt long process line, this metal detector arrived with no belt or drive, and with 1/2 inch thick (each) UHMW sides running through the aperture, and is shown that way in our pictures of it. The overall aperture height of the search head is 16.75 inches high by 13.75 inches wide, but as it now sits, configured with thick UHMW side rails and a 1 inch UHMW bed with no belt, the AS-IS aperture opening as shown in pictures is 15.25 inches high by 11.75 inches wide (between the sides). Assuming a belt is added which is no more than 3/4 inch thick, the usable aperture height will be a nominal 14.75 inches. We assume it would be best to remove the sides to allow the full 13.75 inch width. (Thus we calculated our 14.75 inch high by 13.75 inch wide usable aperture dimensions). The conveyor bed is now 64 inches overall length, without belt, drive or idler sprockets, and will be approximately 72 inches when completed with those. The UHMW conveyor bed sits at a 31.5 inch working height on threaded rod adjustable feet. Complete with a pneumatic push-off reject cylinder with a stainless steel reject catch tray 16 inches long by 10 inches wide by 1 inch deep. The conveyor is configured for right-to-left product flow from the operator controls position, and the push-off goes from right to left from the perspective of one standing at the infeed looking toward the discharge. Also mounted on the conveyor is a stainless steel power supply box for the metal detector. 110 volt single phase electrical input. All food-grade sanitary stainless steel / washdown construction. Configured for vertical aperture orientation for containers, standing cartons, standing pouches, or other tall-product metal detection. This food process metal detection system has digital operator controls with product presets facilitating the fine tuning and quick changeover for multiple products. As of this writing, this rectangular aperture metal detector is in stock in very good operational condition, available for immediate shipment as-is, or with reasonable lead time, can be completed by our shop with belt, sprockets and drive for a timely shipment. 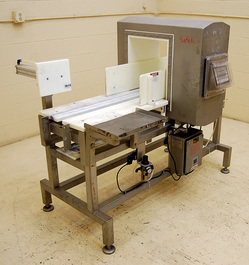 LOMA Model SUPERSCAN MICRO ISC, DIGITAL METAL DETECTOR with STAINLESS STEEL THRU-CONVEYOR. 5 inch high by 17 inch wide USABLE aperture opening in a stainless steel search head enclosure, with digital operator controls. The detection head is mounted on a 16 inch wide by 72 inch long belt conveyor running right to left product flow direction (from the perspective of the control panel, with a plastic interlocking chain type belt, complete with belt stop / alarm reject system. The conveyor belt is currently configured to run at a 26" working height, but can be easily changed. Digital operator controls with product presets facilitating fine tuning and quick changeover for multiple products. 110 /220 volt (standard household current) single phase electrical input for both the detection head and conveyor drive. As of this writing, this conveyorized metal detection system is in stock in good operational condition, available for timely shipment. ...manufactuer rated for 100 lbs product capacity in it's 24 inch wide by 16 inch long by 20 inch deep 4 cubic foot capacity mixing vessel. 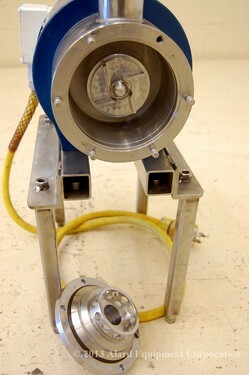 Agitator has three paddles on a center shaft inside a counter-rotating outer "sweep" ribbon. TILT to dump discharge. All stainless steel product contact surfaces, including a stainless steel hinged top cover. Painted steel support frame with manual tilt-to-dump lever. Powered by 110 volt / 220 volt single phase (standard household current) drive. GARB-EL Model GHV-1000 10 HP HEAVY VOLUME GARBAGE DISPOSAL, manufacturer rated for 3,000 to 5,000 lbs per hour. 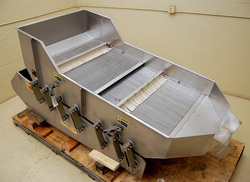 30 inch wide by 28" long by 12 inch deep stainless steel tapered infeed hopper. Stainless steel auger trough with steel auger and fixed hammers. 1 inch diameter perforated screen on discharge. 45.5 inch infeed height on adjustable foot pads. 10 HP 3 phase fixed speed drive motor on hammers; .25 HP 110 volt single phase motor on auger. Complete with on/off operator controls. As of this writing, this HEAVY DUTY industrial waste disposal grinder is in stock in EXCELLENT operational, mechanical, electrical and cosmetic condition, ready to go and available for immediate shipment. YOUNG Model 909 KNIFE CUTTER - HEAVY DUTY STAINLESS STEEL GRINDER / COMMINUTOR / GARBAGE DISPOSAL / HAMMERMILL manufacturer rated for particle size reduction by cutting, shredding, or granulating, with cutting action ; including tough or fibrous materials such as vegetables, fruit rinds, roots, pulp, bark, drugs, yarn, rags, cork, cured rubber, paper products, felt, leather, sheet plastics, vinyl records, and fiberglass. Similar to a hammermill, product output size is determined by interchangable perforated screens. The product is retained in the cutter cavity until released through the screen. Food grade sanitary stainless steel contacts. 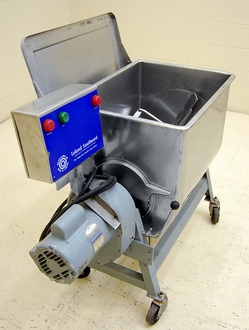 This continuous high-volume shredder / chopper consists of a 9 inch by 11.5 inch infeed hopper feeding into a 9 inch by 9 inch cutting chamber, with 3 stationary blades and 3 revolving blades. The cutting blades are arranged in a staggered pattern so that only one blade is in contact at any given time, reducing shock and allowing for smooth continuous cutting. Currently fitted with 3/8" perforated screen; --other screens are available from the manufacturer; with perforations from .020 inch up to 1/2 inch. Powered by a 7.5 HP 208/230/460 bolt 3 phase drive. As of this writing, this multi-cut knife cutter is in stock in very good condition, available for timely shipment.